Waterbury Clock Co. "No. 43-22", in the catalogs and is also called "Varsity" sometimes, as stated on the old label on the back. Not shown in the Waterbury trade catalogs. The "Experts" tell me these cases were sold only to Coca Cola for their use as advertising clocks. 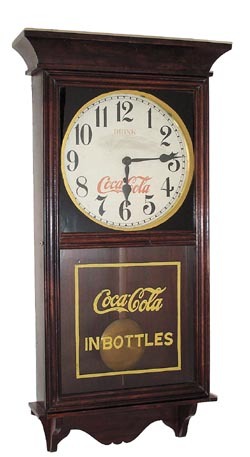 The Coca Cola paper dial looks to be old; the bottom Coca Cola glass is probably a replacement. 8 day, time only nickel movement, marked only "20", and "84". The movement is A shaped, and it is running. Old mahogany case is 34 inches, has the correct pendulum, and as I said in the beginning, a label on the back.